New addition to the International Portfolio has Italian roots and branches all over the world. A foreign shareholder wants to take control of Macmahon. We think it makes sense. Selling cheap fuel and doing a better job of selling everything else. The cards were dealt for significant value realisation. Jumbo played about the worst hand possible. 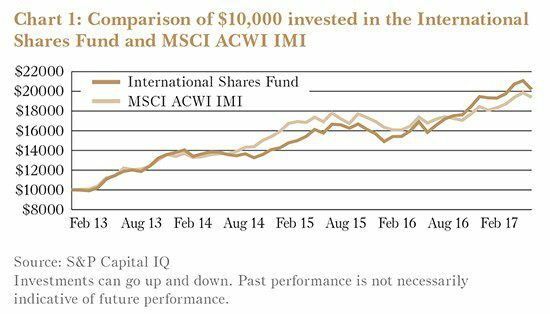 Strong years for both Funds will mean investors may be inclined to extrapolate our returns. Don’t get lulled into a false sense of security – your commitment to us is going to face much tougher tests. As you will read in the 2017 Performance Report that accompanies this quarterly report, the past financial year was an excellent one. Our original Australian Shares Fund produced another year of 20% plus returns and managed to do so in a period that was generally unfavourable for investors at the smaller end of the market. The newer International Shares Fund had what was hopefully a defining year, with a number of core investments paying off in a big way and the fund generating a return of more than 30% excluding currency impacts (a strong currency reduced that to 27%). It is still only marginally ahead of its index in the four years since inception but the evidence is increasing that applying the same long term investing approach works as well elsewhere as it does here. So what should you expect for the future? Well, you should not extrapolate recent history. As you know, I don’t have the faintest idea what markets are going to do. But I do know that the past few years have been particularly favourable. Stockmarkets have increased, but not by too much, and the inclining trend has been punctuated by a number of significant retractions that allowed us to put cash to work in both funds. The market falls we have experienced have been in the magnitude of 10-20% and rebounds have been rapid. That is a friendly backdrop for a contrarian investor. 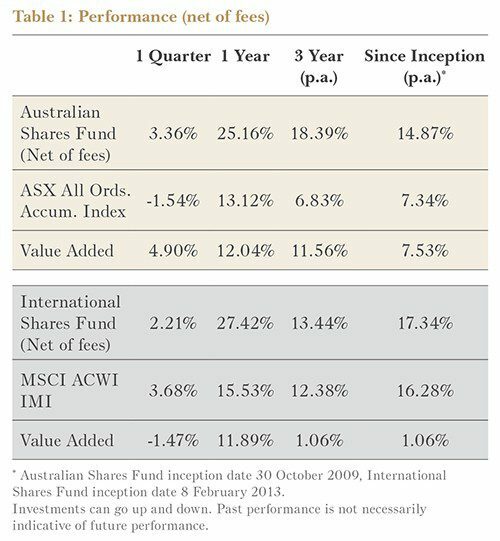 Even friendlier has been the timing of our individual stock returns in the Australian Fund. 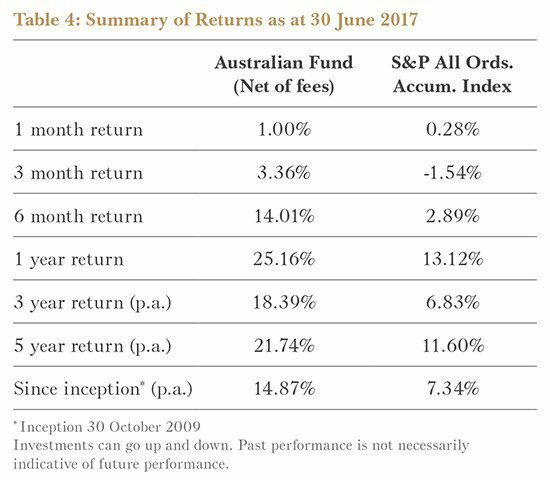 Again, you can read the details in the Australian Fund section of the performance report, but we have made a few disastrous investments during the past five years. 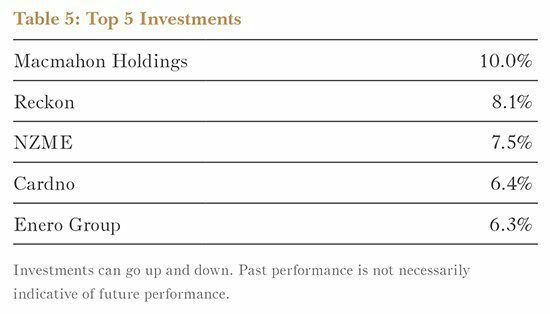 You haven’t seen that in the overall portfolio returns, though, because the disastrous investments have gone wrong at the same time successful investments have come right. While the outperformance of that fund has been remarkably consistent, it could have unfolded in a very different way. 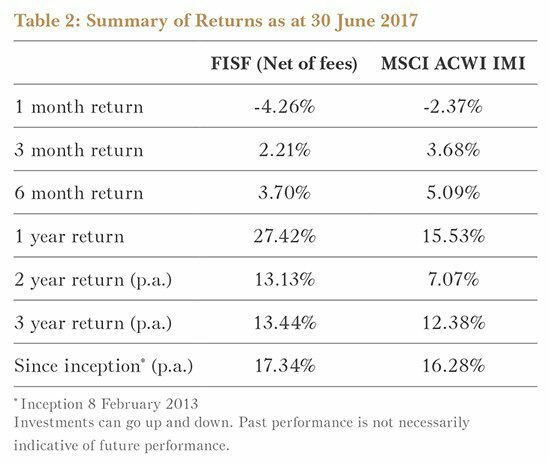 While it goes without saying that 20% returns per annum should not be expected in future, our job is to outperform the market. That is why you pay us fees and if we don’t achieve it over a five year period, you should consider taking your money elsewhere. However, the outperformance, should we achieve it, is likely to come with a lot more variability than it has over the past few years. Forager runs relatively concentrated portfolios of often unloved securities. There will be years of underperformance, perhaps significant, and there will be years when the returns are negative. When I started Forager in 2009 I didn’t have any experience or a track record. The people who decided to invest with us did so because they knew me, understood the philosophy and thought it a decent chance of outperforming the market over the long term. The success we have had has only been possible because of this tight alignment between our investors and our own investment approach. You invest for the long term. That allows us to invest for the long term. Don’t get lulled into a false sense of security by the past five years. Your commitment to us is going to face much tougher tests. It is worthwhile contemplating that in advance. A potential recruit recently asked me what our competitive advantages are as a business. The barriers to entry in funds management are extremely low. Anyone can start a funds management business and someone with as little as a million dollars can probably have a decent crack at it. Some of the most successful businesses in the space are less than 20 years old – witness the meteoric rise of Magellan Financial Group. That suggests some of the future’s most successful businesses are not even born today. It would be naïve to think any competitive advantage we have is strong. But I did point out a few reasons for the business having a stable future. One is the relationship and trust we have built with a long-term client base. That is something that can be replicated, but it takes more time and effort than most are prepared to commit. Two is the intellectual prowess of the people who work here. There are plenty of brains in the industry but few combine those brains with the emotional fortitude to be genuinely long-term. Three is a willingness to stay small. It is this third attribute that is often under-rated when people look for a fund manager to invest with. Let me give you a small example of the way in which size impedes returns. The ASX is currently littered with fallen angels – growth stocks that were once loved by the market that have disappointed their investors by failing to deliver on growth expectations and have seen their share prices plummet as a result. One of the few that caught our attention was printing and IT services company CSG (ASX code CSV). The company’s financial reporting is opaque and, with some divisions growing and others shrinking, it is difficult to pin down a valuation with confidence. At $0.45 per share though, we thought it offered enough margin of safety to justify an investment. In late May we started buying the stock and were able to accumulate roughly 2 million shares before the share price took off. Back when we were managing just $20 million, those 2 million shares would have been a decent 4% position. Today our weighting to CSG ended up at less than 0.5% of the portfolio, a barely worthwhile position. Size doesn’t just restrict the number of stocks a fund manager can invest in. It takes longer to get in, can be impossible to get out when you are wrong, and you tend to move the price in both directions. But you also often end up with lower weightings than you would ideally like. And that can hurt future returns as much as anything else. A number of people seem perplexed about our self-imposed constraint of $200m of funds under management in ASX- listed equities. As CSG shows, life is already more difficult, and it only gets harder as you go up from there. Staying small is one competitive advantage that is within our control. After a little more than a year, Daniel Mueller has decided to leave Forager and his replacement, Alex Shevelev, started with us in the first week of July. 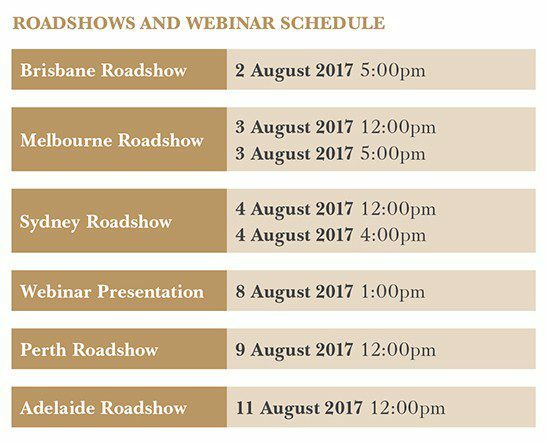 Please come and introduce yourself if you are attending one of our upcoming roadshows. Gareth Brown, currently based in Vienna, is moving back to Australian shores in early July. Gareth will still be primarily responsible for European equities but will be doing the job from Sydney. He is always up for a coffee if you are in the CBD. I touched on the importance of people above but it is worth re-iterating. Lots of businesses say the same thing, but your returns are genuinely dependent on our decision making ability. The total amount of tangible assets in this business is probably less than $20,000. I still think of us as young and relatively inexperienced. I still think we have a lot to learn. The financial year just ended, however, was our eighth. Few funds management firms make it to a decade. Today we have more than $300m under management and good track records across the business. We are growing and growing up, and that makes getting recruitment and staff development right more important than ever. After very healthy returns in the past financial year, the Fund has been doing a lot of selling and cash levels are rising. One place where value still can be found is in more cyclical stocks. This report outlines two such new positions, one in the US and the other in Europe. Voters across Europe continued experimenting with how best to stick a middle finger to the political establishment. As we suspected, far right nationalistic parties achieved less success than expected in recent European elections. In France, Emmanuel Macron easily won the presidency in May under the banner of En Marche! In June, the party won an absolute majority of seats in the National Assembly. Not bad for a party Macron founded barely 12 months ago. Elections in the UK were less convincing. Theresa May called very early elections hoping to establish a more convincing mandate to help with Brexit negotiations. Labour party leader Jeremy Corbyn—who might lead an establishment party but can hardly be thought of as conventional—was considered an easy beat. Instead, Labour picked up a lot of votes while the Tories lost support and their majority. They’ve still been able to form a minority government with the Democratic Unionist Party, after promising to send a lot of pork in the direction of Northern Ireland. The UK election outcome has shaken confidence and not without reason. It will be hard to get anything done at a time when the UK has a lot to do. Confusion is likely between now and Brexit, and possibly afterwards, and we’ve seen that in the share prices of some of our holdings. In June, the US Federal Reserve raised overnight interest rates by 25 basis points, the third such increase in 6 months. Minutes from their June meeting further outlined plans to continue unwinding the massive crisis-era stimulus program in the months and years ahead. That will be done with a careful eye on inflation, the economy and financial market stability. The policy, in American spelling, is ‘normalization’. As Jim Grant quipped, though, the Fed is prepared to ‘re-abnormalize’ at the first sign of trouble. If you have visited Rome, you might wonder how so many temples, bridges and aqueducts constructed during Roman times are still standing. Cement, a mix of crushed limestone, clay and volcanic ash provides the answer. When mixed with water, cement gives strength and durability to concrete. Nearly 2,000 years have passed and this ‘Roman recipe’ has hardly changed. Cement has become a huge industry. Consumption globally stands at nearly 4 billion tonnes annually and cement makers generate more than US$250 billion a year in sales. Big business doesn’t necessarily mean good business for shareholders, though. Due to volatile end-demand, high fixed costs and capital intensity, the cyclical swings can be enormous. And even if one takes a whole-of-cycle view, cement manufacturing can be either a terrible or a wonderful business. The difference all comes down to local industry structure. The country in which cement was invented is one place where the business has been rather terrible. 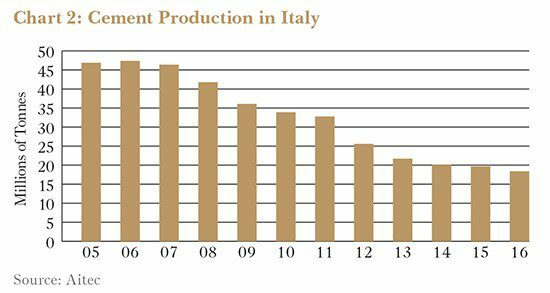 As you can see in the accompanying chart, following the financial crisis Italian cement production (a proxy for demand) has decreased from 48 million tonnes in 2006 to only 18 million in 2016 – a 63% drop. That’s the cyclical part. But there’s also the structural part. There are more than 15 cement makers in Italy. The majority of these own just one or two plants. A reduction in industry-wide capacity is the key to improving the economics of the overall industry. But when taken singularly, the incentive for industry players is to do the exact opposite. If they can cover their fixed costs, it makes sense for them to continue to produce while waiting for the market to recover. With so many players, industry rationalisation had proven elusive. Over the last decade annual capacity has fallen to about 30 million tonnes as older plants have been mothballed. But that’s not enough in a world where demand is below 20 million tonnes. All cement businesses are still struggling to turn a profit. Rome-based Cementir (BIT: CEM) is one such business and one of the Fund’s most recent investments. In Italy last year, Cementir generated €120m in revenue and operating losses of €20m. Why have we bought a cement maker operating in a market with such crappy economics? The first reason is Cementir’s operations outside Italy dwarf its domestic business. And some of those operations are in nations and markets where it benefits from much better industry structures. Setting up a cement plant requires significant upfront costs. Annual production capacity of one million tonnes requires about US$200m of investment. Also, cement is a commodity product where price matters most so manufacturing scale and efficiency are paramount. Cement is also heavy and costly to transport. So it makes sense to produce it in large plants located close to both limestone quarries (a key input) and customers. For these reasons, once a cement business becomes established in a region, it’s hard to steal its business. Cementir is the only cement manufacturer in Denmark, for example, where it has an 82% market share. Sales and operating profits in this region have averaged nearly €300m and €50m respectively over the past decade. Return on capital has averaged 12%. The company also has operations in Sweden, Norway, Belgium, Turkey, Egypt, Malaysia and China. So despite being listed in Italy, it is mostly exposed to other economies with less fragmented local cement industries. Less than 15% of the Group’s €1.1 billion of sales belong to the troubled Italian operations. The first reason is Cementir's operations outside Italty dwarf its domestic business. And some of those operations are in nations and markets where it benefits from much better industry dynamics. The other reason for our interest in Cementir is that the Italian market is finally making some moves towards consolidation, and perhaps better economics for remaining participants. In 2015 Heidelberg (DB: HEI) acquired Italcementi, the leading Italian cement company. Recently, Cementir acquired Sacci and Buzzi Unicem (BIT: BZU) acquired Cementi Zillo. This wave of consolidation should help improve the industry structure. If the company can just break even in Italy it will add meaningfully to profitability. It should do better than that if Italian demand recovers modestly, which is a decent bet. Turnaround potential also exists in the operations in Turkey and Egypt. Currently Cementir has a market capitalisation of €830m. Its cement businesses should earn circa €80m in net profits in 2017, after carrying the burden of loses in Italy. This implies that the group is trading on price to earnings ratio of about 10 times. This looks cheap considering that the current level of profitability should improve in the future. The stock is up 15% on the Fund’s average purchase price, and represents 3.5% of Fund assets. Rising share prices have forced the Fund to exit a significant number of U.S. holdings over the past year. Fortunately, we’ve also found some useful new ideas. One of those companies, Murphy USA, Inc. (NYSE: MUSA), first came to our attention after we noticed several members of the management team buying stock. After some deeper digging and a bumpy first quarter result which saw the stock decline 10%, the Fund accumulated a position. Murphy USA owns a network of approximately 1,400 convenience stores throughout the United States. One might deride the term ‘convenience store’ as merely a fancy moniker for a petrol station, but have you seen petrol stations lately? Nowadays you can walk into one and load up on organic beverages, freshly baked bread, toilet paper, and craft beer, and then sit down and eat a hot meal from a well-known food chain like Subway or Taco Bell. You could probably do a week’s worth of grocery shopping in a pinch. Murphy does not belong to this new and exciting frontier of convenience stores. Its stations often consist of a simple kiosk that sells fuel, cigarettes and little else. Customers choose Murphy for its cheap prices and convenient locations—the majority of Murphy’s locations sit within Wal-Mart (NYSE: WMT) parking lots. Playing off Wal-Mart’s focus on low prices, Murphy USA aims to be the cheapest seller of fuel in its markets. This is no easy feat. Petrol stations earn razor thin margins on fuel. 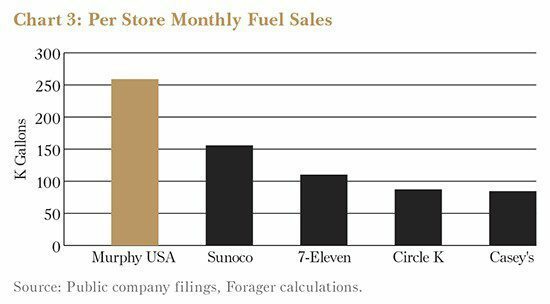 Typically fuel serves as the bait to get customers inside the store where they might purchase more profitable goods. If you want to offer fuel at a cheaper price than your competitors and still earn a profit, you need a unique business model. To undercut its peers, Murphy capitalises on numerous advantages. Its proximity to Wal-Mart gives it a massive advantage in traffic flow. That translates into fuel volume sales that trounce the rest of the industry. 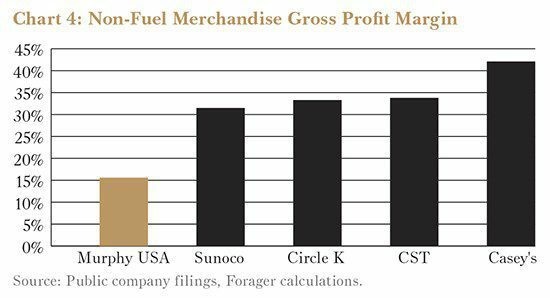 When you sell twice as much fuel as your nearby competitor, you can afford to offer it for a few cents less per gallon. Murphy also owns gasoline storage and transmission assets that enable it to source its fuel cheaply. And the service station business in the US is still surprisingly fragmented—most of its competitors are single-store operators who lack the resources and scale to replicate Murphy’s business model. There is much to like about Murphy’s business as it stands today. But the company also has opportunities to improve and grow its earnings. Murphy USA aims to be the cheapest seller of fuel in its markets. This is no easy feat. Murphy’s current store base reaches less than half of Wal-Mart’s footprint. And while the company has ended its exclusive partnership with Wal-Mart, its strategy still involves locating new stores near those of the retailer. Over two thousand Wal-Mart Supercenters do not sell fuel, so Murphy has a runway for new store growth that extends many years into the future. Murphy needs to do a better job with its non-fuel related business. As we mentioned earlier, the ‘inside store’ portion of a petrol retailer’s operation generally produces the bulk of profit. Not so with Murphy, which has significantly lagged its peers in this department. But the company has embarked on a campaign to update its dated store base. It is converting kiosks to proper retail storefronts where it can expand its merchandise. It has also partnered with a new supplier to offer customers a more appealing, modern mix of goods. We believe success in this initiative will add meaningfully to the company’s profit. Listening to management, we are convinced we have found a team focused on cash generation and shareholder value. This business can suffer the odd jolt on occasion, as the most recent quarter illustrates, but management remains focused on the proper priorities with an eye on the long-term. Almost since inception in 2013, the Fund has owned stock in Alphabet Inc. (NASDAQ: GOOG), the holding company of Google. It is hardly an obvious contrarian position, but we’ve long been believers in the strength of the business. Google’s core operations will continue to benefit from the long-term shift in advertising away from traditional media to digital. Because search advertising has been around for so many years, one tends to think of it as mature. But search and other forms of digital ad spending represent only 34% of all advertising. That percentage increases every year so plenty of opportunity remains for digital to grow. Within digital, mobile search and video represent the fastest growing destinations for ad spending. Google owns powerful franchises in both, capturing over 45% of all incremental dollars flowing to those platforms. Machine learning will also provide important opportunities for Google in the years ahead. Google has already incorporated machine learning into some of its products: an updated search algorithm, better voice recognition capability with its Google Home console, and a ‘smart bidding’ platform for keywords for its advertising clients are examples. This technology should flow into all aspects of Alphabet’s organisation, giving the company even more of an advantage. The pre-tax profit from Google's core business returns a 6.5% earnings yield on its current market valuation. The current yield on a 10-year U.S. bond stands at less than 2.5%. Digging into the numbers, Alphabet’s stock price looks reasonable compared to its earnings and risk profile. Stripping away Alphabet’s ‘Other Bets’ collection of emerging businesses, the pre-tax profit from Google’s core business returns a 6.5% earnings yield on its current market valuation (after adjusting for its massive cash balance). The current yield on a 10-year U.S. bond stands at less than 2.5%. The stock is certainly not risk-free, but such a yield gap strikes us as more than adequate given the powerful advantages that Google enjoys. And since it is growing that profit (at 20% annually in recent years) that 6.5% earnings yield today should look much higher in just a few years. However Alphabet is in the midst of a rough patch. In June European regulators slapped the company with a €2.4bn fine and cease and desist orders for anticompetitive practices. The EU found Google was promoting its own price comparison services, hurting both rival firms and consumers. The fine itself is not meaningful relative to Alphabet’s US$650bn market capitalisation, but it is indicative that Google’s growing reach and profitability are likely to lead to more intense regulatory oversight. That’s an issue the company can live with and adapt to. We plan on owning the stock for the long-term and are confident that today’s price will look cheap in the years ahead. When the Fund was established in 2013, we theorised that being an outsider—as we are in many parts of the world— would prove advantageous sometimes and a negative at others. It has proven so. One of those areas where cultural naivety has cost us a bit is in understanding how companies in the Germanic world respond to competitive pressure. Having mental models derived mainly from Australian and US experience, we underestimated how dogged German, Austrian and Swiss management teams can be in the face of competition. This is especially so for companies run by a single family for generations, more so if there are several strong family companies within the industry. At times, it seems they’d rather give up all their profit margin indefinitely than lose 0.1% market share. There’s an argument to be made that this might be rational over the very long term. But the ferocity has often surprised us. We’ve seen it with the world’s leading firetruck company, Austria’s Rosenbauer International AG (WBAG:ROS). Sales have progressed largely as hoped when we first bought the stock towards the end of 2013. Sales have been particularly strong in Germany, which is a huge market for the company. But profitability in Germany has all but evaporated, as the company participates in an extended bunfight with a few key competitors—some of whom are currently losing money hand over fist. We hope that situation improves, but there might be a few more bloody rounds yet. Fortunately the company makes good money elsewhere in the world. The propensity to fight tooth and nail over market share is also evident in German DIY retail, in which Fund investment Hornbach Baumarkt AG (DB:HBM) participates. When we bought the stock four years ago, our downside was largely covered by the company’s significant real estate holdings and that remains the case. In 2013 the company’s German operations generated less than half the profit margins of its stores elsewhere in Europe. Our upside case depended on German DIY margins ‘normalising’. Instead, it is the low margins that have proven normal. This is despite some industry consolidation after a competitor went bankrupt a few years ago. In German-speaking markets, if there are just one or two strong competitors, there is greater potential for a price war than you might expect looking at other parts of the world. It is a lesson that now firmly sits in our toolkit. You will have received notification in recent days about the Fund’s final distribution for the 2016/17 year, which came to 11.02 cents per unit. Adding that to the special distribution paid in early March, investors will have received 21.02 cents this year. A breakdown of the components of the total distribution will be on your individual tax summary, which will be available towards the end of July. The bulk will be realised capital gains and the dividend component will be unfranked. The unusually large distribution was the result of a good year for performance, an absence of offsetting losers and a lot of profit taking as many positions simultaneously reached our estimate of fair value (see the June 2017 Annual Performance Report). While we aim to minimise unnecessary tax bills for our investors, we intend on remaining vigilant regarding selling those holdings that reach full value. Tax bills are not pleasant but better than investment losses. While many commentators declared 2017 the year value investing died, the Forager Australian Shares Fund has had a stellar year. This quarter we reflect on a few old holdings driving that performance and introduce one new opportunity. Another financial year has drawn to a close and it has been an action packed one for the Forager Australian Shares Fund. The Fund closed in December and the units now trade under the ASX ticker FOR. Inside the portfolio, some long-held stocks have finally been delivering results and a few new names have made it into the portfolio. Our March quarterly report discussed the need to actively extract value out of two of the Fund’s largest portfolio holdings, Jumbo International (JIN) and Enero Group (EGG). We didn’t expect things to happen quite so rapidly. Jumbo is an online-reseller of lottery tickets in Australia. Thanks to a near monopoly on the lottery market, Tatt’s Group (TTS) is effectively Jumbo’s only supplier (Jumbo does sell some charity lottery tickets but revenue is negligible) and Jumbo represents approximately 7% of Tatts’s sales nationally. In April we were approached by a broker seeking to purchase a strategic stake in Jumbo on behalf of Gibraltan lottery company Lottoland. (Lottoland sells synthetic tickets on Australian and international lottery results and is effectively a new competitor to Tatts). Prior to the approach, Forager’s stake was 13% of Jumbo’s outstanding shares and, while we didn’t want to sell the lot, we saw a lot of potential value in giving Lottoland a seat at the table. The sale of a 5% stake was agreed at $2.55 per share and Lottoland purchased another 2% on market, giving it a 7% holding. Our thinking was that this could only be positive. Lottoland might use its stake to launch a bid for the whole company at a higher price. Were that to happen, Tatts would be forced to respond (it could hardly let 7% of its revenue migrate to a competitor). 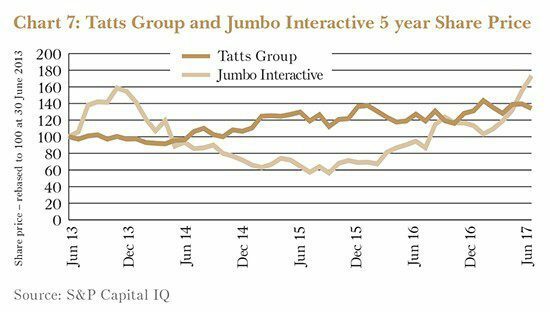 Lottoland could offer Jumbo a better deal than Tatts is currently offering, increasing both revenue and margins for Jumbo. Or, the threat of a competitor could give Jumbo the opportunity to negotiate a much better deal with Tatts. The cards were dealt for some significant value realisation. Not wanting to sell Lottoland’s tickets is understandable. There are serious regulatory risks, let alone the moral concerns around selling an alternate product that doesn’t pay any taxes to the government. But why wouldn’t you at least pretend to entertain the idea? And why would you give your dominant supplier a blocking stake in the company at a discount to the market price? At the very least we were expecting the new deal to include the right to sell in Jumbo’s home state, Queensland, but they couldn’t even manage to extract that. The share price is up, but our estimate of the value is down. That means the margin of safety has evaporated. The cards were dealt for some significant value realisation. Unfortunately Jumbo played about the worst hand possible. future. Having just fended off a takeover offer from its largest shareholder CIMIC Group (CIM), shareholders are now being asked to consider another transformational proposal. This time the board is recommending a deal that will involve issuing 44% of the company’s equity to an Indonesian company in exchange for a mining contract worth US$2.9bn of revenue over its 14 year life. In 2015 mining conglomerate Newmont, Japanese trading house Sumitomo, and local miner Bumi Resources decided to sell their combined 82% stake in PT Amman Mineral Nusa Tenggara (AMNT), owner of the giant Batu Hijau mine copper and gold mine in Indonesia. The purchasers were listed Indonesian company Medco Energi (JKSE:MEDC) and fellow Indonesian company AP Investment (API). These two companies are respectively controlled by the Panigoro and Projosasmito families, two of Indonesia’s wealthiest business families. If this is sounding confusing, don’t worry. 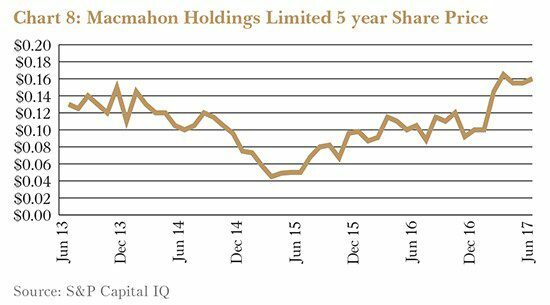 The opaque structure is one of the concerning elements about the proposed transaction (in addition, the entity that will own 44% of Macmahon’s shares has the same shareholders as, but a different ownership structure to, AMNT). Doing business in Indonesia has historically been difficult for Australian companies and many have lost significant sums of money. And we have enough experience in the wider Asian region to know that you don’t let a controlling shareholder onto your register without giving it serious thought. Having given it exactly that, however, we have decided to vote in favour of the deal. The starting point is not a nice open share register. Macmahon already has a significant shareholder in CIMIC. That shareholder is a competitor and has shown absolutely no interest in offering fellow shareholders a fair price or helping the company grow and prosper. AMNT is going to exert more influence, but it is going to reduce CIMIC’s influence considerably and at least brings with it a transformational contract for the company. The contract itself has been constructed to assuage a number of shareholder concerns. The revenue will be set at a level that anticipates a specific margin to Macmahon, with the potential for upside sharing and a cap on the downside at zero margin. The shares being issued to AMNT will be held by an Australian trustee for 30 months and, should the contract be terminated within that 30-month period, there is a mechanism for Macmahon to re-purchase a portion of those shares in exchange for the equipment it is buying from AMNT. If the contract turns out to be a disaster, it should largely be able to be unwound. We are less concerned about the sovereign risk than others. Macmahon’s new CEO Mick Finnegan has a lot of experience operating in the region and Macmahon is entering into a services contract, not buying a mine. And the new owners of AMNT are financial buyers. They are doing this deal because they don’t have the skills to operate Batu Hijau themselves. We have enough experience in the wider Asian region to know you don't let a controlling shareholder onto your register without giving it serious thought. Most importantly, however, this transaction is going to make Macmahon more profitable and reliable. If shareholders vote in favour, our valuation on the stock increases roughly 20%, from something like $0.20 per share to $0.24 or so. It is a big if, yes, but if Macmahon can put its unprofitable Telfer contract behind it, it should be generating earnings per share of 3 cents or so in the 2019 financial year. If, as looks likely, its successful Tropicana contract gets expanded and extended, that would give Macmahon an order book that looks solid out to 2025 – the sort of thing stockmarkets tend to get excited about. There have been more than enough disappointments during the four years Forager has owned this stock. There won’t be any chicken counting for a few years yet. The new management team has been impressive over the past six months, and on balance there is enough upside to stay on for the ride. Forager has recently become a substantial shareholder in CTI Logistics (CLX), a courier and warehousing services company. CTI has a strong competitive position within the Perth delivery market where it carries out 30% of on-demand taxi-truck deliveries, 35% of courier deliveries, and 40% of same-day parcel deliveries. CTI also provides third party contract warehousing and it’s the national market leader in storage and distribution of floor coverings such as vinyl and carpet. The end of the mining boom is hurting the company’s businesses. In 2016, CTI generated $150m in revenue but only $2m in net profits. As you can see in the chart above, the company’s share price has plummeted from as high as $2.75 in 2013 to $0.84 cents today – a 69% drop. CTI’s current market capitalisation is only $62m. While last year’s sales reached the highest level on record due to an acquisition, profitability was well below what CTI has earned in the past. In 2014 and 2015 net profits were $10m and $6m respectively on a much lower revenue base. Since then, competition has increased and demand for the company’s services fallen, but CTI should be able to adjust its cost structure to the new market conditions. CTI only owns a small fraction of the vehicles it uses and most of its workers are contractors. Once the economy recovers CTI should bounce back. Its 30-year old delivery network is a hard asset to replicate. Furthermore, the flooring business should continue to grow as it benefits from a new bigger warehouse. Based on the 2017 half-year result, CTI should be able to earn net profits of about $6m for the full year. This implies it’s trading at a multiple of about 10 times these ‘depressed’ earnings. Importantly, the company has net tangible assets of $63m and $20m worth of franking credits. These provide today’s investor downside protection. While we don’t spend much time talking to management we strive to understand whether their interests are aligned to those of shareholders. We also look at their past capital allocation decisions to gauge how capable they are in their line of business. Insider ownership is usually one of the first things we look at when assessing management – there is no bigger incentive than ‘having skin in the game’. Management turnover is also an important factor. CTI’s three main directors own nearly 60% of the company and have at least 30 years of history with the business – each. While a long tenure and significant insider ownership are big positives, they can mean little without good financial performance. On this score, CTI’s directors have done an outstanding job over the years. As shown in the chart below, book value per share has grown from 18 cents in 2004 to $1.25 today, a compound annual growth rate of 17%. This is even more impressive when considering the company paid 58 cents in dividends per share over the period. Given the attractive valuation and management’s great track record, Forager bought shares in the company in late May. This has mostly happened through a small placement of new shares. 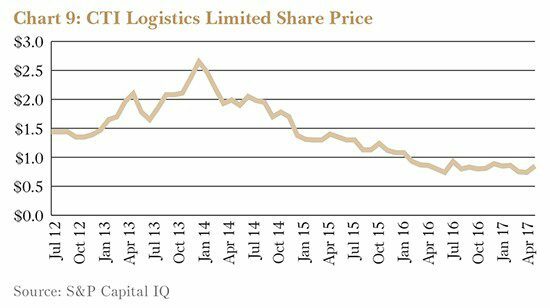 About 2.4% of the Forager Australian Shares Fund is invested in CTI Logistics. 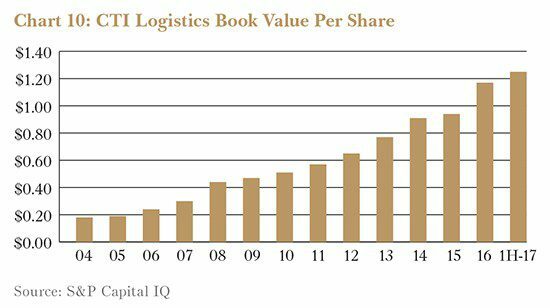 CTI's book value per share has grown from 18 cents in 2004 to $1.25 today, a compound annual growth rate of 17%. While it is a promising investment, CTI’s shares are extremely illiquid with only a few thousand shares trading a day. Investing in illiquid securities is not a problem per se. In fact, it’s often one of the reasons why a stock might be mispriced. But, it presents some challenges for fund managers, especially those who manage open-ended funds. 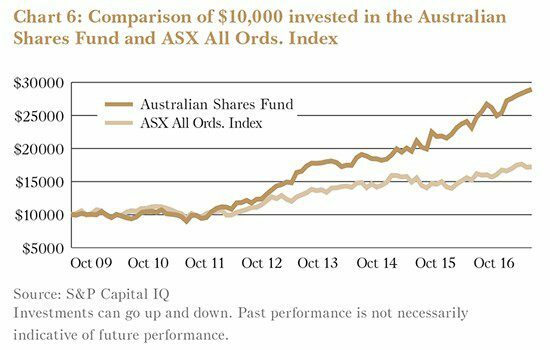 The Australian Fund has historically held many stocks that have low trading liquidity. This required the Fund to keep a high cash balance at all times in order to protect the Fund from an unusually large number of investors deciding to redeem their units at once. Trying to sell illiquid stocks on the market in a hurry can obviously be costly. Since the Fund closed to new investors and converted to a Listed Investment Trust (LIT), Fund liquidity is not a concern. CTI is exactly the sort of business we had in mind when making the change. 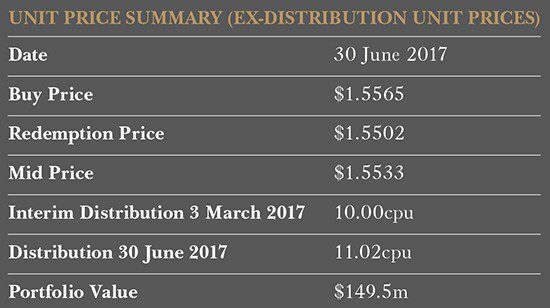 Since listing on the ASX, FOR units have traded at a fairly consistent premium of more than 10% to the underlying net tangible assets (NTA). The premium is frustrating for some investors who would like to buy more units or initiate an investment in the Fund (less so for those who want to sell). Apart from performing poorly, there is not much we can do to narrow the gap. If Forager delivers results well in excess of the index over time, then the units are more likely to trade at a premium. The current premium is likely a consequence of the Fund’s success and a lack of willing sellers. While it will undoubtedly wax and wane with overall markets and the Fund’s relative performance, our focus will remain on growing the NTA and being transparent with investors. The market will have to look after itself. The distribution for the 2017 financial year will be 11.18 cents per unit and, as per usual, will be mostly comprised of discounted capital gains. For those who elected to take the cash, you should see the distribution in your bank account by 21 July. If you elected to participate in the distribution plan, your account should show the new units by the end of the month. They will be issued at the 30 June net asset value post the distribution, which was $1.7164 per unit.